One of my favorite things to read about is innovation. For those of you that know me, that’s not really a surprise. However, I think that there’s a lot of misunderstanding out there about what “disruptive” innovation is. Most people think that apps that modify the way you do something is disruptive. For example, people have said that companies like Kayak and Hipmunk are both disruptors of booking travel. However, the true disruption came from travelocity or orbitz, whichever came first. These sites really did change the way the game was played for booking travel because they essentially cut out both the middleman (travel agents) and the airlines involvement in book flights. Anything beyond that has simply been sustaining innovations. These are innovations that are quickly co-opted by the existing incumbents as it’s possible for them to do that. A more disruptive technology for travel would view the process holistically from the moment you booked the trip to the time to returned home from your completed vacation. The site would need to account for getting you to your destination without any sort of delays. In James Womack’s book Lean Thinking, they point out the “value add” activity of a flight was only 3 hours, while the total waiting time was over 12 and they didn’t include the effort it took to book the trip back in 1995. All inclusive it’s likely to be much worse now. Especially the way that airlines measure “on time departure” (leaving the gate on time) which is different than our “on time departure” (taking off on time). In a true disruptive situation you’ll typically see the incumbents resorting to changing laws to keep their supremacy of the markets, we don’t see this in travel at all. Where we do see this is in telecom and cable. The image below from Mashable pretty well explains why this is happening. 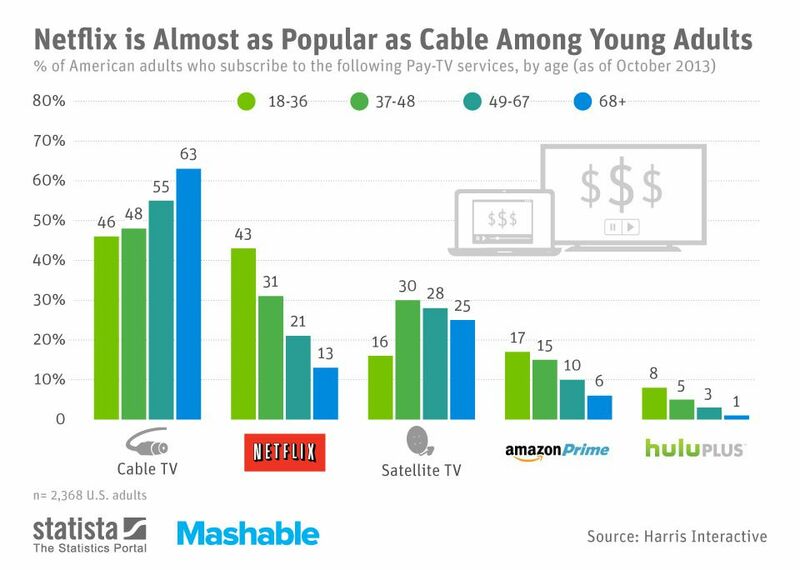 There’s likely overlap between users of Netflix, Prime, and Hulu, but if I was cable TV I’d be running scared. I also would love to see this graphic if you add Twitch.tv and specifically ESPN. I think eventually twitch will be disrupting ESPN and the traditional sports networks out there. How are the cable companies using legal and technical mechanism to limit access to content on Netflix, Amazon, Hulu, and Twitch? First, the movie industries have absurd agreements with cable companies (providers) giving their services, like Xfinity from Comcast first access to content. In many cases this will translate into something earlier on the subsidiaries of those in terms of networks. Second, cable providers use their control over the network to throttle the internet speeds of these internet services. This is leading them to try to change the laws around net neutrality so that the cable providers don’t just become “dumb pipes” that content is passed through but the users don’t interact with. I believe this also indicates that both cable networks and internet providers are being disrupted in a way that they don’t understand. They are using every tool they have at their disposal to fight against the adoption of these services, but they don’t understand what’s happening. Consumers have hired comcast, verizon, and others to provide them a solid consistent connection to whatever content the user wants. Internet providers are trying to force themselves into a middleman role that the users don’t want. When opportunities arise that will allow the user to experience content on their own terms. It’s clear that cable TV is losing the fight and this will only accelerate as people purchase more tablets and devices like that. Chromecast (which allows people to display things from a laptop/tablet on their TV) is another disruption that Google is providing, Amazon has something similar for their Tablets (which will increase Prime usage by the way). The TV companies are losing and need to figure out new business models to stay afloat. This is where disruption is happening. Not in other spaces. This entry was posted in Business, Culture, Economics, Innovation and tagged Amazon, amazon prime, cable, disruption, Hulu, Innovation, Mashable, netflix, tablet. Bookmark the permalink. ← Amazon’s potential army of Drones – what’s the point?